Author(s): Jerry Boulanger, A.Sc.T. - J-Clan Services Ltd. This chapter was orginally written by Kent Peterson and updated by Jerry Boulanger in September, 2018. Central cooling systems are an attractive method for cooling individual buildings by connecting them onto a common cooling loop. Central cooling systems can displace several small localized chillers with central systems that have options that are not feasible at individual sites. Facilities managers should consider a number of factors when evaluating the merits of central cooling systems. These factors include annual operating costs, annual use of energy and domestic water, the age and condition of the existing systems, and availability of capital. Central chiller plants offer several advantages over individual building air conditioning systems. Central chiller plants can take advantage of the diversity factor in the sizing of equipment and operation of the plant, as all connected loads will not peak at the same time. Less capital is required for central cooling equipment than for equipment in many individual buildings. Operations and maintenance (O&M) staffing costs are minimized and easier to control due to the centralized equipment location. Increased efficiencies are possible with large heating and cooling equipment, which reduces operating cost per unit of energy output. Part-load performance efficiencies are substantially improved by the ability to meet the system load with the most efficient equipment. Continuous and accurate monitoring of operating efficiencies is practical when the equipment is centralized. Single-point delivery of purchased utilities allows for favorable rates to a large-volume customer. Multiple fuel sources can also be a practical alternative. Major repairs/replacements of plant equipment may be less disruptive when done in a central plant building vs. a building occupied by clients and/or employees. Central systems present some disadvantages over cooling equipment distributed in individual buildings. Thermal and hydraulic losses occur in large-distribution networks. These losses must be evaluated against the increased generating efficiencies of a central plant. The initial construction cost requires a large capital investment. Therefore, the most cost-effective options may have to be deferred if capital cannot be secured. Major equipment such as chillers, pumps, and cooling towers should not be purchased without a set of detailed specifications on the items being purchased. These specifications establish the minimum quality and the maximum energy consumption that will be acceptable for each item. The equipment should not be accepted until it is tested to demonstrate compliance for capacity and performance. Be aware that this may add significant cost. It is important to remember that the efficiency of a central plant is measured by dividing the energy supplied by all the energy inputs (chillers, pumps, and cooling towers). The goal is to deliver the required cooling throughout the year with the least amount of energy input. It is therefore necessary to understand how the central cooling plant will perform at all anticipated load conditions. 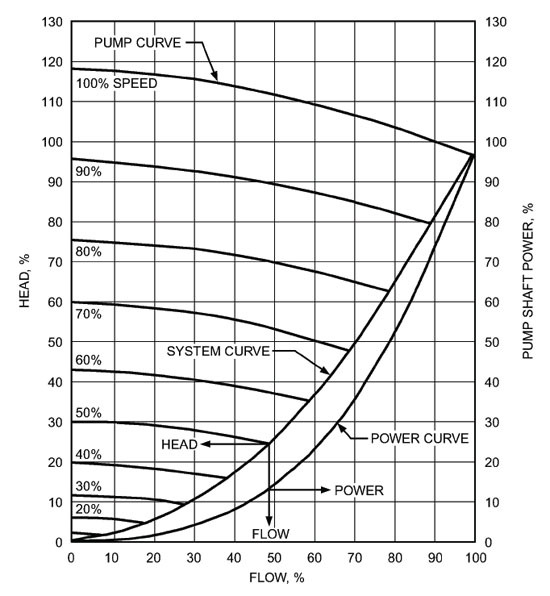 pump and system curves, with an emphasis on understanding the nature of variable-speed pumping. Starting at point 3, the refrigerant is a liquid at high pressure. As it passes through the throttling device (also called the thermal expansion valve and orifice) to point 4, the pressure drops. At point 4, the refrigerant is a mixture of liquid and gas. At this point the gas is called “flash gas.” At point 3, the liquid refrigerant upstream of the throttling device has been cooled to a temperature below saturation. This effect is called “subcooling” and has the effect of reducing the amount of flash gas, as shown by point 4. From point 4 to point 1 the liquid is converted to a gas by absorbing heat (refrigeration effect). 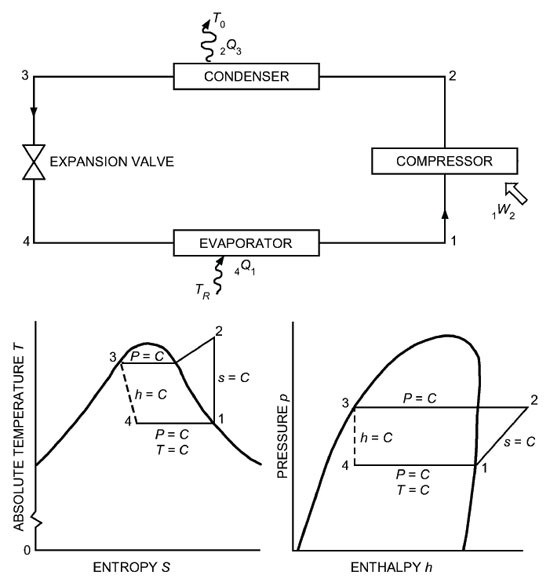 From point 1 the refrigerant is drawn into the suction of the compressor where the gas is compressed, as shown by point 2. At point 2, the temperature and pressure of the gas have been increased. The refrigerant is now called “hot gas.” Notice that this point is to the right of the saturation curve, which also represents a superheated state. The hot gas, point 2, moves into the condenser where the condensing medium (either air or water) absorbs heat and changes the refrigerant from a gas back to a liquid as shown by point 3. At point 3, the liquid is at an elevated temperature and pressure. 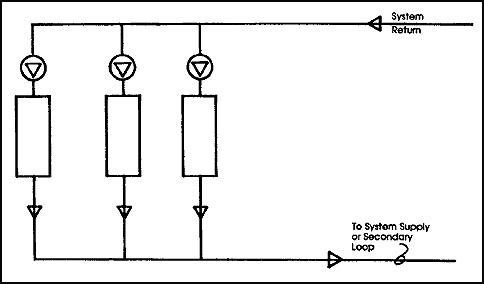 The liquid is forced through the liquid line to the throttling device and the cycle is repeated. Many chiller types are available to match the specific needs of a given chiller plant. Factors affecting chiller selection include energy sources, prime movers, physical size, load requirements, anticipated load profile throughout the year, and refrigerant selections. Energy sources, prime movers, and refrigerants are discussed separately later in this subchapter. The three types of chillers most commonly used in central chiller plants are rotary, centrifugal, and absorption. A wide variety of chiller combinations can occur, especially in plants that have undergone multiple phases of expansion. There are a number of types of rotary compressors used in the heating, ventilation, and air conditioning (HVAC) industry, including scroll, single blade (fixed vane), rotating vane, and screw (helical-rotary). Single blade and rotating vane compressors are generally used in smaller applications and will not be discussed further here. Scroll compressors are largely replacing reciprocating compressors for the smaller chiller sizes (although there are scroll machines up to 400 tons in capacity). In packaged water chillers the most commonly used compressor is the screw. There are two types in use today: the single screw and the multiple screw. The single screw consists of a single cylindrical main rotor that works with a pair of gaterotors. The compressor is driven through the main rotor shaft and the gaterotors follow by direct meshing action. As the main rotor turns, the teeth of the gaterotor, the sides of the screw, and the casing trap refrigerant. As rotation continues, the groove volume decreases and compression occurs. Since there are two gaterotors, each side of the screw acts independently. Single-screw compressors are noted for long bearing life as the bearing loads are inherently balanced. Some single-screw compressors have a centrifugal economizer built into them. This economizer has an intermediate pressure chamber that takes the flash gas (via a centrifugal separator) from the liquid and injects it into a closed groove in the compression cycle, with the result of increased efficiency. The single screw is controlled from a slide valve in the compressor casing that changes the location where the refrigerant is introduced into the compression zone. This causes a reduction in groove volume and hence the volume of gas varies (variable compressor displacement). The machines are fully modulating. The single screw has slide valves on each side that can be operated independently. This allows the machine to have a very low turndown with good part-load energy performance. The twin screw is the most common of the multiple screw compressors. The twin screw is the common designation for double helical rotary screw compressor. The twin screw consists of two mating helically grooved rotors, one male and the other female. Either the male or female rotor can be driven. The other rotor either follows the driven rotor on a light oil film or is driven with synchronized timing gears. At the suction side of the compressor, the gas fills a void between the male and female rotors. As the rotors turn, the male and female rotors mesh and work with the casing to trap the gas. Continued rotation decreases the space between lobes and the gas is compressed. The gas is discharged at the end of the rotors. The twin screw has a slide valve for capacity control, located near the discharge side of the rotors, which bypasses a portion of the trapped gas back to the suction side of the compressor. In recent years manufacturers have introduced screw chillers with variable-speed drive (VSD) controls. In addition to great part-load performance, these chillers offer significantly reduced noise and wear at off-design conditions. Centrifugal chillers are by far the most popular chiller type in central cooling systems. They are available in sizes ranging from 90 to 10,000 tons. They are simple to operate, reliable, compact, and relatively quiet; have low vibration; and are designed for long life with low maintenance. Centrifugal compressors are dynamic compression devices (as opposed to positive displacement) that on a continuous basis exchange angular momentum between a rotating mechanical element and a steadily flowing fluid. Like centrifugal pumps, centrifugal chillers have an impeller that rotates at high speed. The molecules of refrigerant enter the rotating impeller in the axial direction and are discharged radially at a higher velocity. The dynamic pressure of the refrigerant obtained by the higher velocity is converted to static pressure through a diffusion process that occurs in the stationary discharge or diffuser portion of the compressor just outside the impeller. A centrifugal compressor can be single stage (having only one impeller) or multistage (having two or more impellers). On a multistage centrifugal compressor, the discharge gas from the first impeller is directed to the suction of the second impeller, and so on for as many stages as there are. Like the rotary compressor, multistage centrifugals can incorporate economizers, which take flash gas from the liquid line at intermediate pressures and feed this into the suction at various stages of compression. The result is a significant increase in energy efficiency. Like reciprocating compressors, centrifugal compressors can be either open or hermetic. Open centrifugal compressors have the motors located outside the casings with the shaft penetrating the casing through a seal. Hermetic centrifugal compressors have the motor and compressor fully contained within the same housing, with the motor in direct contact with the refrigerant. Because the discharge pressure developed by the compressor is a function of the velocity of the tip of the impeller, for a given pressure, the faster impeller speed, the smaller the diameter needs to be. Similarly, for a given pressure, the more stages of compression there are, the smaller the impeller diameter needs to be. With these variables in mind, some manufacturers have chosen to use gear drives to increase the speed of a smaller impeller, while other manufacturers use direct drives with larger impellers and/or multiple stages. There are pros and cons to both systems, but direct drive machines have fewer moving parts and fewer bearings and are generally simpler machines. The capacity of centrifugal compressors is controlled by three methods. The most common is to use inlet guide vanes or prerotation vanes. The adjustable vanes are located in the suction line at the eye of the impeller and swirl the entering refrigerant in the direction of rotation. This changes the volumetric flow characteristics of the impeller, providing the basis for unloading. A second control method is to vary the speed of the impeller in conjunction with using inlet guide vanes. Not unlike a variable-speed fan or pump, reducing the impeller speed produces extremely good part-load energy characteristics. The impeller must produce an adequate pressure differential (lift) to move the refrigerant from the low-pressure side (evaporator) to the high-pressure side (condenser). It is this lift that determines the minimum speed of the impeller. The lower the lift, that is, the closer the temperature difference between the evaporator and condenser, the more slowly the impeller can rotate. When the impeller is at the slowest possible speed, further reductions in capacity are obtained by using the inlet guide vanes. With VSDs and aggressive water temperature reset schedules, centrifugal compressors can produce the most energy-efficient part-load performance of any refrigerant compressor. It is important to note that centrifugal compressors with VSDs use both the VSD and inlet vanes for control. The inlet vanes are used to prevent the chiller from getting into surge. For efficient operation the controls must either dynamically measure or model surge so that the bulk of the unloading can be done by the VSD. This is particularly important with primary-only variable-flow plants as some manufacturers' systems use load as an input to the surge map and they measure only temperature and not flow. There have been cases where VSD minimums have to be set at 40 percent or higher to prevent the chiller from tripping from surge at low flows. As described for the screw chillers above, centrifugal chillers with VSDs have both lower noise and reduced wear at off-design conditions. A third method of capacity control for the centrifugal chiller is hot gas bypass (HGBP). Like other types of compressors, HGBP can be used to unload a machine to zero load by directing the hot gas from the compressor discharge back into the suction. There are no part-load energy savings with HGBP. It is used only as a last resort when very low turndown is required and cycling the machine on/off would not produce acceptable results. One of the characteristics of the centrifugal compressor is that it can “surge.” Surge is a condition that occurs when the compressor is required to produce high lift at low volumetric flow. Centrifugal compressors must be controlled to prevent surge, and this is a limit on part-load performance. During a surge condition, the refrigerant alternately moves backward and forward through the compressor, creating a great deal of noise, vibration, and heat. Prolonged operation of the machine in surge condition can lead to failure. Surge is relatively easy to detect in that the electrical current to the compressor will alternately increase and decrease with the changing refrigerant flow. Just before going into surge, the compressor may exhibit a property called “incipient surge” in which the machine gurgles and churns. This is not harmful to the compressor but may create unwanted vibration. The electrical current does not vary during incipient surge. Absorption chillers are used in many central plant applications. They are available in sizes ranging from 100 to 1,500 tons and are usually operated by low-pressure steam or hot water or are directly fired with natural gas. The higher O&M costs associated with these chillers, compared with those of compressor-type units, usually make them uneconomical to use except where electric power is expensive, where fuel costs are low, or when balancing electrical and thermal loads in cogeneration facilities. The absorption process, while appearing quite complex, is in reality the same refrigeration process discussed previously except the compressor has been replaced with an absorber, generator, pump, and recuperative heat exchanger. The following description is based on lithium-bromide and water, which is the most common process among several possibilities. In the absorption refrigeration cycle, the low-pressure (high vacuum) refrigerant (water) in the evaporator migrates to the lower pressure absorber where it is “soaked up” by a solution of lithium-bromide. While mixed with the lithium-bromide the vapor condenses and releases the heat of vaporization picked up in the evaporator. This heat is transferred to condenser water and rejected out the cooling tower. The lithium-bromide and refrigerant solution (weak solution) are pumped to a heat exchanger (generator) where the refrigerant is boiled off and the lithium-bromide (strong solution) returns to the evaporator. As the hot lithium-bromide (strong solution) returns to the evaporator, a heat exchanger cools the liquid with the cool mixture of lithium-bromide and refrigerant (weak solution). 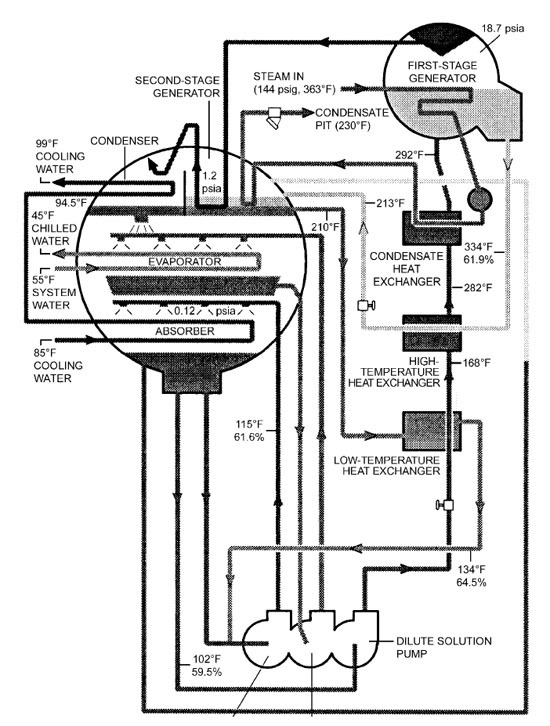 The boiled-off refrigerant migrates to the cooler condenser, where it is condensed back into a liquid and returned to the evaporator to start the cycle again. 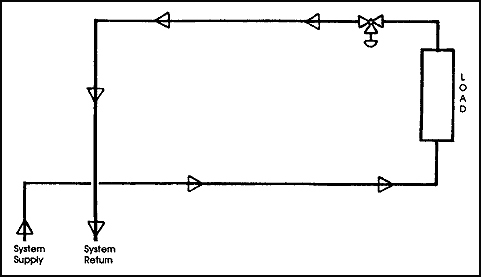 Absorption machines can be direct-fired or indirect-fired. The direct-fired absorber has an integral combustion heat source that is used in the primary generator. An indirect-fired absorber uses steam or hot water from a remote source. A double-effect absorption process is similar to that described above except that a generator, condenser, and heat exchanger are added. The refrigerant vapor from the primary generator runs through a heat exchanger (secondary generator) before entering the condenser. The secondary generator with the hot vapor on one side of the heat exchanger boils some of the lithium-bromide and refrigerant solution (weak solution), creating the double effect. The double-effect absorption process is significantly more energy efficient than the single-effect absorption process. The lithium-bromide is a salt with a crystalline structure that is soluble in water. If the saturation point of the solution is exceeded, the salt will precipitate out and form a slush-like mixture that can plug pipes and make the machine inoperable. Crystallization does not harm the equipment but is a nuisance. Usually air leakage or improper (too cold) temperature settings cause crystallization. However, crystallization is generally not a problem in modern equipment that uses microprocessor-based controls. The microprocessor continuously monitors solution concentration and automatically purges the system. Absorption machines are controlled by modulating the firing rate of the direct-fired machine or modulating the flow of steam or hot water in the indirect-fired machine. Variable-speed refrigerant and solution pumps greatly enhance the controllability of the absorption machine. To work properly, refrigerants must have low toxicity, low flammability, and a long atmospheric life. Recently, refrigerants have come under increased scrutiny by scientific, environmental, and regulatory communities because of the environmental impacts attributed to their use. Some refrigerants — particularly chlorofluorocarbons (CFCs) — are believed to destroy stratospheric ozone. The relative ability of a refrigerant to destroy stratospheric ozone is called its ozone depletion potential (ODP). CFCs are being phased out according to the 1987 Montreal Protocol. The production of CFCs in developed countries ceased in 1995, and their most common replacement, halogenated chlorofluorocarbons (HCFCs), are due for phase-out in the 21st century. Replacements are currently being developed for HCFC R-123 and HCFC R-22, which are commonly used in the industry. For all practical purposes, however, HCFCs should be available well into the middle of the 21st century and certainly within the lifetimes of machines currently being manufactured. The global warming potential (GWP) of refrigerants is another significant environmental issue. Gases that absorb infrared energy enhance the “greenhouse” effect in the atmosphere, leading to the warming of the earth. Refrigerants have been identified as “greenhouse gases.” Theoretically, the best refrigerants would have zero ODP and zero GWP, like R-717 (ammonia). Although some refrigerants used in a particular system may have a direct effect on global warming, there will also be an indirect effect on global warming as a result of that system’s energy consumption. The indirect effect is caused by the burning of fossil fuels and subsequent release of carbon dioxide. To reduce greenhouse gases to the greatest extent possible, it is critical to focus on the system’s overall energy efficiency, not just to consider the refrigerant’s GWP. Several different types of prime movers are used to drive chillers. Electric motors and steam turbines are the most common, but reciprocating engines and gas turbines have also been used, with varying degrees of success. Commercial cooling places the highest summertime demand on the electrical systems and the second highest annualized energy consumption on electrical utilities. Growth in cooling is expected to increase significantly in upcoming years, and electrical utilities will have difficulty meeting these demands if the chilling equipment is driven primarily by electric sources without thermal energy storage. That is why the utility companies have provided, and will continue to provide, incentives to encourage their customers to look at thermal energy storage systems and district cooling alternatives. The steam turbine drive is excellent for larger capacity chillers, because it is a smoothly rotating power source, is available in all horsepower ranges, and can usually match the compressor's design speed without using a speed-increasing gear. Steam turbine drives are sometimes selected to make use of existing boilers in a central heating plant. Using the existing boilers saves on the capital cost, improves the year-round load factor on the steam-generating equipment, and takes advantage of possible reductions in off-season fuel rates. Electric motors are the most common drives on centrifugal chillers, especially with hermetics. However, hermetics are available in sizes only up to about 1,850 tons, so conventional-type motors are used on open-drive centrifugal chillers in the larger sizes. Electric motor drives offer several advantages but also have limitations. Synchronous electric motors run at exact speeds: 3,600 rpm, 1,800 rpm, 1,200 rpm, 900 rpm, and so on. Induction-type motors run at slightly less than synchronous speeds, depending on the slip. However, centrifugal compressors operate most efficiently at speeds much higher than the available motor speeds, so it is necessary to provide a speed-increasing gear between the motor and the compressor. The speed-increasing gear imposes additional frictional losses and additional equipment that must be maintained. Gear losses may amount to 1 to 2 percent of the required compressor horsepower. It is sometimes possible to eliminate the speed-increasing gear by selecting a two-stage compressor that operates at 3,600 rpm. This speed may be less than optimum for the compressor but will not result in as much loss as a gear would. Also, 3,600-rpm motors in 2,000-plus horsepower sizes are not off-the-shelf items; each is custom designed and manufactured to meet the requirements of the application. Existing electrical service must be considered when selecting the voltage for a new large-capacity chiller. It may be necessary to bring in a new feeder or to change transformers. In many cases the central chiller plant will be the largest electrical load on campus, and the plant may become the focal point for the incoming utilities. As global economies strive to reduce dependence on fossil fuels, renewable energy and the smart grid will have an impact on the way electricity is generated, delivered, consumed, and purchased. This transformation from fossil fuels to renewable energy such as wind and solar energy will require some effort. The current electric grid has no energy storage component. The electric grid works today because the storage component is from the fuel itself. Fossil fuels are a form of stored energy. The sun and Mother Nature took millions of years to create and ultimately store energy in the form of fossil fuels. The stored energy is not released until the fuel is ignited and burned. Replacing fossil fuels with renewable energy for electricity generation will require a storage component to make the grid reliable. Energy storage will also help the economic viability of renewable energy projects by increasing the usable output of renewable energy generation facilities. There are many types of energy storage technologies. Some technologies can be applied on a large utility grade scale. Pumped hydro, long duration flywheels, compressed air storage, and sodium sulfur (NaS) battery storage are some of the technologies being pursued at a grid scale level. There are also technologies on the customer side of the meter that can be used to store energy as well. Lithium ion batteries, lead acid batteries, and thermal energy storage (TES) can store energy on a building level scale very effectively. Thermal energy storage is an effective solution for storing energy because its cycle effectiveness is better than most of the grid scale storage options and the stored energy form is designed for a specific purpose: peak load shifting of inductive motor loads used to provide cooling. These motor loads are the very loads contributing to the peak demand issues most utilities are experiencing in the summer. Another benefit of TES is that it is dramatically cheaper to store cooling than it is to store an electron that will be used to create cooling. Black and Veatch, in their energy newsletter last year, showed estimated installed costs of $4,000/kW for pumped hydro and $4,500/kW for NaA battery storage on grid scale applications. Flywheels can be installed for about $2,000/kW. Thermal energy storage can be installed for about $1,500/kW. Today’s thermal energy storage market consists of two major types, chilled water storage and ice storage. Either technology is a great energy storage choice for university facilities that need air conditioning. Both technologies have a large installed base with proven reliability and performance. Each technology has is strengths and weaknesses relative to each other. The technology chosen will depend upon specific job conditions and economics. Thermal energy storage systems in their simplest form consist of a mechanical cooling device, a storage tank, a cooling load, and a few more cooling system controls. At night the mechanical cooling device will use nighttime electricity to charge the storage tank, either with ice or chilled water. During the day, the stored ice or chilled water will cool the building completely (full storage) or augment a smaller sized cooling system (partial storage) to cool the building. Water storage systems are generally applied at larger facilities where the economies of scale can decrease the cost of the water storage tank on a per unit basis. Additionally, facilities that have existing chillers and facilities like data centers, which need large amounts of cooling quickly, are great water storage candidates. The water storage tanks can be above ground or below ground and can be specifically designed for a certain footprint, height, and architectural look. Some of the storage systems can also be used to meet fire safety requirements. Some typical applications for water storage TES systems are college campuses, distribution centers, and manufacturing facilities. The economics of commercial ice storage systems allow these TES systems to be applied to a broader range of applications. Because of the heat of fusion, the volume for storing energy is smaller with ice storage TES. Churches, K-12 schools, office buildings, community colleges and universities can benefit from ice storage systems. The ice storage tanks are generally factory assembled while site work is taking place at the project location so ice applications projects are up and running faster. Modular ice storage systems can offer a great deal of safety factors because there are more tanks, and some tanks, depending upon the manufacturer and type, can be redeployed for use at another location or sold to another user. Ice storage systems do require a mechanical cooling device that can make ice. This is a disadvantage in an existing facility with new cooling systems as they may not be able to create the cold temperature to freeze water. Commercial TES systems are affordable with paybacks in less than five years in new construction applications and about seven years or less in retrofit applications. Thermal energy storage systems have been around for some time. Today, TES equipment is better than ever. Application, design, and control best practices have been redefined and developed to provide reliable and affordable energy storage cooling systems. Owners and operators of iconic urban skyscrapers and college campus are using energy storage systems to lower cooling costs by 20 – 40% and reduce peak demand. Today’s TES systems require little maintenance because they have few moving parts, if any, and can last twenty-five years or more. Utility and merchant generators are promoting TES to reduce peak demand while helping renewable energy generation to become more viable. TES offers affordable energy storage on the customer side of the meter. TES can be operational quickly with great cycle efficiencies and continual performance throughout its lifetime. As the infrastructure moves to more renewable energy and a smart grid, energy storage will play an enormous role helping this major transition in electricity generation and delivery. Storage, both grid scale and building scale, will be needed to make this transition reliable and fiscally sound. Often utilities will jump to a grid scale-only solution when other, more viable solutions are available. In the chilled water plant, centrifugal pumps are the prime movers that create the differential pressure necessary to circulate water through the chilled and condenser water distribution system. In the centrifugal pump, a motor rotates an impeller that adds energy to the water after it enters the center (eye). The centrifugal force coupled with rotational (tip speed) force imparts velocity to the water molecules. The pump casing is designed to maximize the conversion of the velocity energy into pressure energy. In the HVAC industry, most pumps are single-stage (one impeller) volute-type pumps that have either a single inlet or a double inlet (double suction). Axial-type pumps have bowls with rotating vanes that move the water parallel to the pump shaft. These pumps are likely to have more than one stage (bowls). The vertical turbine pump is an example of an axial-type pump and is sometimes used in a cooling tower sump application. Double-suction pumps are more likely to be used in high-volume applications, but either a single-inlet or double-inlet pump is available with similar performance characteristics and efficiencies. Variable-speed motors should be considered for the chilled water system. Affinity laws for centrifugal pumps state that the power consumption is the cube of the speed, so even a minor reduction in pump speed will produce a significant reduction in pump energy required. Pump outputs can be adjusted to match required system flows without over pressurizing the system, which improves the overall operating efficiencies. Like chilled water pumps, condensing water pumps can be end-suction, horizontal double-suction, or vertical turbine pumps. If horizontal double-suction or end-suction pumps are used, then the cooling tower basin must be at an elevation that is sufficient to provide a positive head on the suction side of the pumps. Vertical turbine pumps tend to be the preferred type for the larger tonnage cooling towers. The vertical turbine pumps allow most of the basin to be located below grade, which in turn improves accessibility to the pump motors and cooling tower screens. The sump pits associated with the vertical turbine pumps should be designed in strict accordance with the recommendations of the Hydraulic Institute. If end-suction or horizontal double-suction pumps are selected for the condensing water system, it will be mandatory to elevate the cooling tower basin or locate the pumps in a pit to provide sufficient head to the suction of the pumps. Because the head is critical, it is not advisable to use Y-type strainers on the suction of these pumps. It is best to use a rough screen inside the tower basin and then pump through a Y-type strainer to remove the small debris. Pump seals are either mechanical or packing gland-type seals. Mechanical seals are adequate, provided the water is clean and the water treatment is compatible with the seal material. Replacing a mechanical seal is more difficult and time-consuming than repacking a gland-type seal. The packing gland seals depend on friction between the shaft and the packing material to prevent leakage. To prevent damage to the shaft, the packing should not be too tight. It should allow one or two drops of water to leak each minute, which will provide cooling and lubrication to the shaft at this point. For a given impeller size and rotational speed, the performance of a pump can be represented on a head-capacity curve of total developed head in feet of water versus flow in gallons per minute. Total dynamic head (TDH) is the difference between suction and discharge pressure and includes the difference between the velocity head at the suction and discharge connection. Starting from zero flow, as the pump delivers more water, the mechanical efficiency of the pump increases until a “best efficiency point” (BEP) is reached. Increasing the flow further decreases the efficiency until a point where the manufacturer no longer publishes the performance (end of curve). Pump performance curves are a family of curves for different size impellers. Notice that as the impellers get smaller, the pump efficiency decreases. The power (horsepower) requirements are also shown on the performance curve; notice that the power lines cross the pump curve until one value does not cross. This value is called “non-overloading” horsepower because operation at any point on the published pump curve will not overload the motor. Finally, information on the “net positive suction head required” (NPSHR) is shown on the pump curve. This will be discussed in greater detail below. Pump curves are also rated as “steep” or “flat.” The definition of a flat curve pump is when the pressure from “shut-off head” (head at zero flow) to the pressure at the BEP does not vary more than 1.1 to 1.2 times the pressure at BEP flow. When two or more pumps are operated in parallel, a combined parallel pump curve that holds the head constant and adds the flow can be drawn. Similarly, a series pump curve that holds the flow constant and adds the head can be drawn. Variable-speed booster pumps, when required at a building, are typically placed in series with the central plant distribution pumps. For a given impeller size, a family of curves can be drawn to represent the variable-speed performance of a pump. Notice that the BEP follows along a parabolic curve that looks surprisingly like a system curve (this will be discussed in greater detail below). Also notice that the NPSHR (net pump suction head required) lines follow fairly closely with the published end-of-curve lines for the various speeds. The power lines decrease rapidly as the speed decreases, which graphically demonstrates the potential power savings of variable-speed operation in variable-flow systems. Some designers have placed variable-speed pumps in parallel with constant-speed pumps with unexpected results. The constant-speed pump will always overpower the variable-speed pump until the variable speed is increased sufficiently to meet the pressure created by the constant-speed pump. One unexpected result is that as the flow and pressure in the system decrease, the flow in the constant-speed pump increases and the operating point moves steadily down the pump curve. This can result in the constant-speed pump operating beyond the end of its published curve with resultant increase in radial thrust forces and potential cavitation. The major considerations in the design of piping systems are pressure and temperature within the system, velocities in the pipes, pipe material and its compatibility with the contents, expansion and contraction, supports, and insulation. The velocity of the fluid in the pipe is directly related to the pressure loss in the system: the higher the velocity, the higher the losses. Velocity is therefore inversely proportional to the pipe size: the smaller the pipe, the higher the velocity for a given flow. Smaller pipes equate to lower first cost, but the higher losses mean higher pumping cost in perpetuity. There must be an optimum balance between the two in design. Thermal expansion and contraction do not present much of a problem in chilled water systems because the differential temperatures are relatively low, but they cannot be ignored. The most common piping material and method of fabrication for a central chiller is standard-weight, black steel pipe with welded fittings. In addition to welding, methods used to join the pipe include the use of grooved pipe with bolted couplings. The method selected is usually based on personal preference of the owner, the engineer, or perhaps the contractor, if two methods are allowed. A central chilling plant system requires supply and return piping to deliver chilled water to the various buildings. The distribution system may be an intricate network of pipes with hydraulic loops and cross-connections serving many buildings or loads. A large network distribution system can also be served by several plants simultaneously. The piping system may be direct-buried in the earth, located in a shallow trench, or routed in a utility tunnel. The construction materials used will depend to a large degree on the environment in which the piping will be located. The primary distribution system must be designed as carefully as any part of the chilled water system. Size and location of the pipes should be determined from a thermal utility master plan. Pipes should be sized and located to accommodate future loads, if applicable. Pumping cost must also be considered. Four of the most common piping materials for direct-buried chilled water distribution systems are polyvinyl chloride (PVC), polyethylene, ductile iron, and black steel pipe. Material selection depends on the initial material cost, corrosion requirements, operating pressures, joining methods, and expected life. Listed below are some of the advantages and disadvantages of each piping material. Advantages: corrosion resistant, low thermal conductivity, joints are simply pushed together. Disadvantages: higher leak potential, requires thrust restraint, difficult to find with utility location equipment without a tracer wire. Advantages: corrosion resistant, high-quality weld joints, low thermal conductivity, can tolerate freezing of chilled water. Disadvantages: pressure is normally limited to 100 psig, requires specialized equipment and contractor, difficult to find with utility location equipment without a tracer wire. Advantages: joints are simply pushed together. Disadvantages: higher material cost, high thermal conductivity, higher leak potential, difficult to find with utility location equipment without a tracer wire. Advantages: higher pressure rating, high-quality weld joints. Disadvantages: requires a protective coating for corrosion control, requires cathodic protection for corrosion control, requires electrical isolation from other systems to reduce corrosion potential, time-consuming to install, high installation cost. Maximizing cooling coil performance is crucial for the entire chilled water system operation. Chilled water temperature differential will be determined by how well the terminal devices perform. Each coil should be selected to achieve the desired chilled water temperature differential while meeting the airside performance requirements. Listed below is a specification example that can provide some guidelines when specifying coils at a specific location. Entering water temperatures shall be at least 2 °F higher than chilled water plant supply temperature. 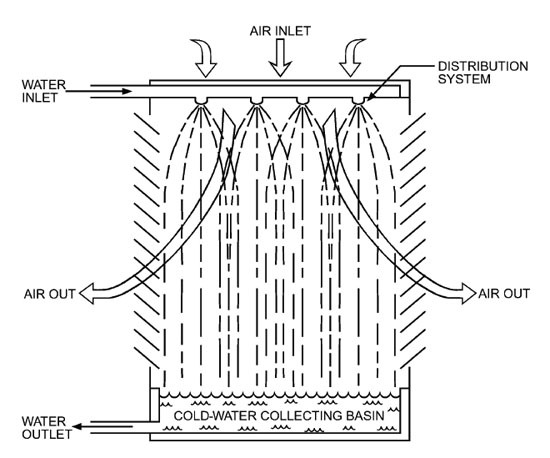 Coil shall perform at least 2 °F higher than design water-side drop of the chilled water plant. Fin spacing shall be maximum 10 fins per inch. Coil shall be drainable, with a vent at the highest location and a drain in the lowest location. Aluminum fins shall be 0.010 in. thick. Tubes shall be 0.035-in. copper with 0.049-in. walled U-bends. Casings shall be galvanized steel. Maximum air velocity shall be 450 ft./min. No water carryover shall occur at rated airflow. Minimum tube velocity at rated capacity shall be 4 ft./sec. Maximum water pressure drop shall be 10 psig. Coils shall be Air Conditioning and Refrigerant Institute rated, with a 0.005 fouling factor. Coils shall be rated for a pressure of 200 psig. Coils shall be sized to the stated entering air condition, airflow rate, discharge air temperature, and entering water conditions. Control valves are a necessity for all cooling coils. Control valves should be selected to match the cooling coil they will control. Pressure drop at the rated flow rate can vary depending on where the cooling coil is located in the pumping hydraulic gradient curve. Attention must be given to selecting modulating control valves for acceptable valve authority and turndown ratio. The control valve will modulate to maintain the desired coil discharge air temperature. Two-way control valves rather than three-way valves should be installed in large campus district cooling systems. Three-way valves cause re-circulation of chilled water, which increases the pumping flow rate and decreases the overall chilled water temperature differential. Care should be taken to provide minimum flow required in the evaporator of the chillers under low flow load conditions when utilizing variable flow chilled water distribution. When necessary this can be provided by the use of a minimum flow bypass valve at the chiller plant. Range: The temperature difference between the water entering the cooling tower and the temperature leaving the tower. 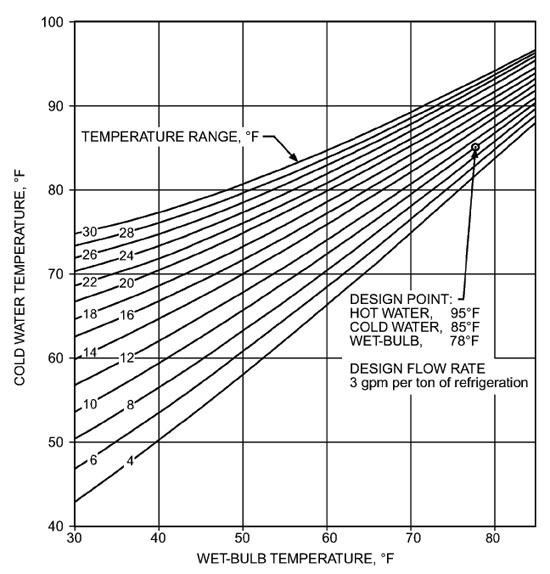 Approach: The temperature difference between the water leaving the cooling tower and the ambient wet-bulb temperature. The performance of a cooling tower is a function of the ambient wet-bulb temperature, entering water temperature, airflow, and water flow. The dry-bulb temperature has an insignificant effect on the performance of a cooling tower. “Nominal” cooling tower tons are the capacity based on a 3 gpm flow, 95°F entering water temperature, 85°F leaving water temperature, and 78°F entering wet-bulb (EWB) temperature. For these conditions the range is 10°F (95-85°F) and the approach is 7°F (85-78°F). Cooling towers come in a variety of shapes and configurations. A direct tower is one in which the fluid being cooled is in direct contact with the air. This is also known as an “open” tower. An indirect tower is one in which the fluid being cooled is contained within a heat exchanger or coil and the evaporating water cascades over the outside of the tubes. This is also known as a closed-circuit fluid cooler. The tower airflow can be driven by a fan (mechanical draft) or can be induced by a high-pressure water spray. The mechanical draft units can blow the air through the tower (forced draft) or can pull the air through the tower (induced draft). The water invariably flows vertically from the top down, but the air can be moved horizontally through the water (crossflow) or can be drawn vertically upward against the flow (counterflow). Water surface area is increased by using fill. Fill can be splash-type or film-type. Film-type fill is most commonly used and consists of closely spaced sheets of PVC arranged vertically. Splash-type fill uses bars to break up the water as it cascades through staggered rows. Typically, in the HVAC industry, cooling towers are packaged towers that are factory fabricated and shipped intact to a site. Field-erected towers mostly serve very large chiller plants and industrial/utility projects. When aesthetics play a role in the selection of the type of tower, custom-designed field-erected cooling towers are sometimes used. In these towers, the splash-type fill is often made of ceramic or concrete blocks. The following is a discussion of the most common types of cooling towers encountered in the HVAC chilled water plant. Spray towers distribute high-pressure water through nozzles into a chamber where air is induced to flow with the water spray. There are no fans. The air exits out the side of the tower after going through mist eliminators. Spray towers are seldom used. One problem is that the nozzles are easily plugged by the precipitation of mineral deposits and by airborne particulates that foul the water. Capacity is controlled by varying the water flow through the tower. This can be accomplished by using multiple-speed pumps or VSDs on the pumps, or by passing water around the tower. Varying the water flow through the condenser of a chiller is not always recommended, as will be discussed under system design considerations. Because air velocities are very low, spray towers are susceptible to adverse effects from the wind. Spray towers are very quiet and can have a very low first cost. 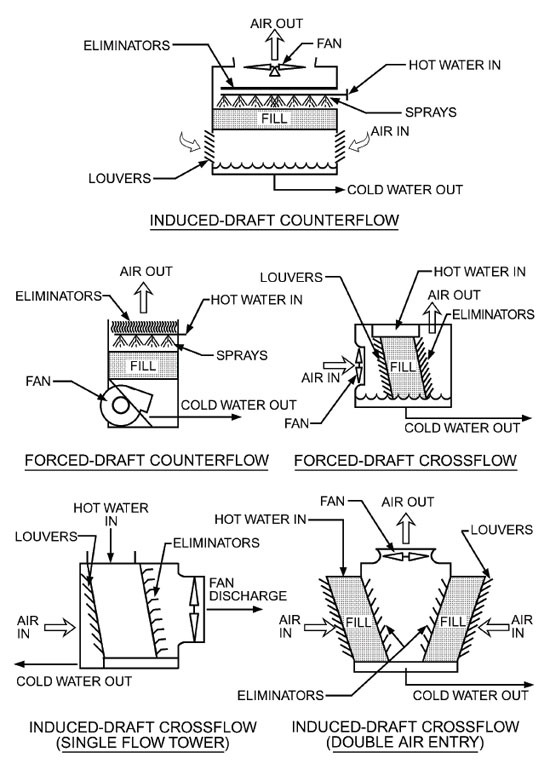 Forced draft towers can be of the crossflow or counterflow type, with axial or centrifugal fans. 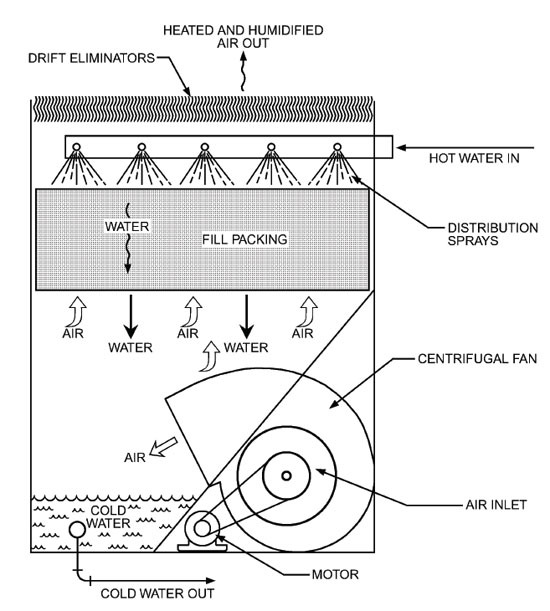 The forward curved centrifugal fan is commonly used in forced draft cooling towers. The primary advantage of the centrifugal fan is that it has the capability to overcome high static pressures that might be encountered if the tower were located within a building or if sound traps were located on the inlet and/or outlet of the tower. Crossflow towers with centrifugal fans are also used where low-profile towers are needed. These towers are quieter than other types of towers. Forced draft towers with centrifugal fans are not energy efficient. The energy to operate this tower is more than twice that required for a tower with an axial fan. Another disadvantage of forced draft towers is that, because of low-discharge air velocities, they are more susceptible to recirculation than induced draft towers. This is discussed in further detail below. The induced-draft tower is by far the most widely used and energy-efficient cooling tower available in the HVAC industry. These towers can be crossflow or counterflow and use axial fans. Most field-erected cooling towers are the induced-draft type. Because the air discharges at a high velocity, they are not as susceptible to recirculation. The large blades of the axial fan can create noise at low frequencies that is difficult to attenuate and, depending on the location on the property, could cause problems. The axial fans have either a belt drive or direct (shaft) drive. Direct drive fans use gear reducers to maintain the low speeds of the fan. Belt drive towers have the disadvantage that the motor and belts are located within the moist airstream of the tower exhaust, making them more susceptible to corrosion and fouling and more difficult to maintain. Belt drive towers usually cost less than towers with direct drives. Belt drive towers allow the use of “pony” motors as a means of speed control. This will be discussed further below. has the primary pump located remotely from the tower. With proper initial chemical treatment, the fluid (usually some form of glycol solution) does not foul the condenser tubes, so chiller maintenance is reduced and energy efficiency is always at peak. Because of the additional heat exchange process, for the same capacity as an open tower, the closed-circuit fluid cooler is physically much larger and significantly more expensive than conventional open towers. When the saturated air leaving the cooling tower is drawn back into the intake of the tower, the recirculation that occurs degrades the performance of the tower. Wind forces create a low-pressure zone on the downwind side of the tower that causes this phenomenon. Wind forces on the lee side of the building can also create downward air movement. When cooling towers are located in such a way that the discharge from one tower is directed into the intake of an adjacent tower, recirculation can also occur. Recirculation is a greater problem when cooling towers are confined within pits, or have screen walls surrounding them. If the tower is sited in a pit or well, it is essential that the tower manufacturer be consulted to determine the proper location of the outlet and minimum clearances for the air intake. As previously discussed the potential for recirculation is greater with forced-draft towers than with induced-draft towers. The Cooling Tower Institute recommends that recirculation effects be accounted for in the selection of the tower. Its tests show that as much as 8 percent of the discharge air could be recirculated back into the intake and that the worst conditions occur with winds of 8 to 10 miles per hour. Where recirculation is a concern, a rule of thumb is that the EWB temperature used to select the tower should be increased by 1°F above the ambient temperature to account for recirculation effects. On/Off: Cycling fans is a viable method but leads to increased wear on belts and drives (if used) and can lead to premature motor failure. This is the least favorable method of controlling temperature. Two-Speed Motors: Multiple wound motors or reduced voltage starters can be used to change the speed of the fan for capacity control. This method is cost-effective and well proven. Because of basic fan laws, there are significant energy savings when the fans are run at low speed. One pitfall with two-speed fans is that when switching from high to low speed, the fan rpm must reduce to below low speed before the low-speed motor is energized. Strategies for optimum operation of two-speed fans will be discussed in the next chapter. Pony Motors: This is another version of the two-speed approach. A second, smaller motor is belted to the fan shaft. For low-speed operation, the larger motor is deenergized and the smaller motor energized for a lower speed. This is a cost-effective and energy-efficient approach. Again, when going from high speed to low speed, the fan must slow down sufficiently before the low-speed motor is energized. Variable-Speed Drive (VSD): Adjustable frequency drives can be added to the motors for speed control. This method provides the best temperature control performance and is the most energy-efficient method of control. It may also be the most expensive. A life cycle cost justification should be done before selecting this method. When comparing VSDs with other approaches, carefully factor the cost of control points for each alternative into the analysis. One pitfall to avoid with VSDs is running the fans at the “critical” speeds. These are speeds that form resonance frequency vibrations and can severely damage the fans. However, most HVAC VSD’s can now be programmed to avoid critical speeds. Consult with cooling tower manufacturers before using VSDs. VSD operation can also reduce drift losses, thereby reducing water use and chemical treatment. Cooling towers are notorious for requiring high maintenance. The use of cooling towers has been linked with the outbreak of legionellosis (Legionnaires’ disease). Unfortunately, cooling towers are very good air scrubbers. A 200-ton open cooling tower can remove 600 pounds of particulate matter in 100 hours of operation. Because they are open to the atmosphere, the water is oxygen-saturated, which can cause corrosion in the tower and associated piping. Towers evaporate water, leaving behind calcium carbonate (hardness) that can precipitate out on the tubes of the condensers and decrease heat transfer and energy efficiency. Blowdown: To control dissolved solids a portion of the flow of the tower should be discharged into the sewer. A rule of thumb is that for a buildup of no more than 2 to 4 concentrations of hardness, the blowdown rate should be about 0.5 to 1.0 percent of the total flow rate. Scale Prevention: Control of the pH (acid levels) is extremely important. Acids, inorganic phosphates, or similar compounds are commonly used to control pH. Corrosion Control: Corrosion can be caused by high oxygen content, carbon dioxide (carbonic acid), low pH, or high dissolved solids. Blowdown is the most practical solution. Biological Growth: Slime and algae are handled with shock treatments of chlorine or chlorine compounds. It is best to alternate between two different compounds so that organisms do not develop a tolerance to the chemicals. Foam and Scum: Usually caused by excess organic material. Cleaning the machine is the best remedy. New technologies are being introduced for the treatment and cleaning of cooling towers. One treatment is the introduction of ozone (O3) into the cooling water. Ozone is a very aggressive oxidizer and when properly applied can be effective at reducing biological growth. One pitfall in the use of ozone is that if left unchecked, large concentrations of ozone will cause runaway corrosion of piping and cooling tower basins. Ultraviolet (UV) lights have also been used to control biological growth when coupled with suitable filtration systems. Another promising nonchemical method employs pulsed electromagnetism to remove dissolved solids and inhibit biological growth. In light of fan selection, flow rate, range, EWB, and fill volume, cooling towers have a wide range of performance characteristics. Typical performance curves show the relationship between these variables at different operating conditions. In regard to the typical performance curve, one feature not well understood is that for a given range, as the EWB decreases, the approach increases. As EWB drops, it is likely that the load (range) will also decrease for the same flow rate. Yet even at this condition, the approach still increases over design condition. This is particularly important when considering the selection of cooling towers for use with waterside economizers. To obtain the maximum effectiveness at low wet-bulb temperatures, a cooling tower used in a waterside economizer system should be larger than a tower selected just for maximum peak duty. Cooling towers are relatively inexpensive compared with the total cost of a chiller plant, and incremental increases in tower size and energy efficiency can be purchased at a very low cost. Skimping on the cooling tower is penny wise and pound foolish. Every effort should be made to optimize the selection of the tower. Matching larger fill volumes with lower fan capacities is a very good investment. For a given design of a cooling tower, the manufacturer will normally attribute a maximum and minimum flow condition to the tower. The maximum flow is usually based on the capacity of the water distribution system within the tower to adequately distribute the water over the fill. Too much flow will overflow the tower distribution pans and create a situation in which the tower does not get adequate mixing of air and water to perform properly. At minimum flow the water may not distribute evenly across the entire fill. This creates voids where there is no water in the fill. When this happens the airstream will tend to travel through the fill area with no water and will not mix properly with the fill area that has the water. This creates a significant decrease in the expected performance of the tower. Another drawback to operating under the minimum flow is that at the boundary where the water and high-velocity air meet, a condition is created where the water is carried up through the fans and the tower “spits” water. Prolonged operation below the minimum water flow can also cause scaling to occur on the fill where the water is missing. These low-noise propeller fan towers are generally as quiet as a centrifugal fan tower without sound traps, are less expensive, and have better energy performance. Filters: Sidestream filters include either sand filters or centrifugal separators. Do not use swimming pool sand filters for cooling towers. Sidestream filters generally circulate about 10 percent of the system flow. Fan breaks or stops: These are devices that prevent the fan from rotating backward. Consider these options if multiple cells are used and backflow airflow through a down fan may cause it to rotate in reverse. Starting a reverse-rotating fan can damage the motor, although if VSD’s are used the VSD should be able to ‘catch’ a rotating motor . As conditions for reverse rotation seldom occur, these options are rarely applied. Vibration switch: This stops the fan if vibration exceeds a certain limit. It could prevent catastrophic failure of the fan. Codes in some areas require the installation of a vibration switch. Ladders and access platforms: Any area where maintenance personnel need to inspect, repair, or replace equipment should have adequate access. Without easy access, towers may not be maintained to the degree that protects the chiller plant investment. Vortex breaking inlet screens: These prevent air from being drawn into the pump suction. They are essential accessories. Sump heaters may be required in cooler climates where draining of the tower is not an option during periods when there is a chance of freezing conditions. Chiller plants have two water systems that require conditioning and treatment. As outlined above, condenser water systems have equipment to monitor the quality of the water, to add chemicals, to maintain desired levels of dissolved solids, and to add makeup water to offset evaporation, leakage, and blowdown. The chilled water system has pot feeders for adding corrosion inhibitors to the system and a coupon station for measuring the effectiveness of the inhibitor. A filtering system is necessary to remove solids such as dirt, rust, and debris from the chilled water. Individual strainers and filters are required on sensitive equipment that may be plugged by contaminants in the system. Sidestream filters can be installed within the chiller plant to continually filter a small portion of the total flow, as it is generally not feasible to install a filter system with sufficient capacity to accommodate the entire chilled water flow. Unless the side-stream filter has its own pump, the side-stream flow will have to be generated by the system pump. Chilled water makeup is needed to replace losses from leaks and maintenance activity. Makeup can occur by pumping water from a storage tank or by using a regulator and backflow preventer to take water directly from the domestic water system. Overall system pressure is regulated by this makeup. It is desirable to have the chilled water system pressure below the domestic water pressure to prevent potential contamination of the domestic water system if a cross-connection inadvertently occurs. There should only be one makeup location. Makeup should be measured by using a conventional water meter with a good turndown ratio to detect low makeup flow rate. Expansion tanks are required on the chilled water system to accommodate the expansion and contraction associated with any thermal liquid system and to provide a point of constant pressure in the system. The expansion tank should be built with bladders to isolate the air from the liquid. Air becomes trapped within the chilled water system whenever equipment or piping is restored to service after the chilled water is drained from the system. Entrapped air can adversely affect the operation of the chilled water system by significantly reducing chilled water circulation and heat transfer. Difficulty due to the compressibility of air can occur when the system pressure on a particular segment of the system is relieved for maintenance activities. Automatic air release valves should be added to high points within the system where air can be trapped, including chillers, tanks, piping, and terminal equipment. If it is necessary to place vents at high points, etc., to do periodic venting of air, they should be manual vent valves piped to an accessible location. Operating and safety controls are furnished as part of the chiller package. Instrumentation such as pressure gauges, thermometers, and flow measuring devices must be specified where they are required or desired. Pressure gauges should be provided on the inlet and outlet of all vessels, pumps, and strainers. For accurate readings, it is preferred to use one pressure gauge with multiple tap points and isolation valves where the gauge will be used to check differential pressures. Thermometers with wells should be provided at the inlet and outlet of all equipment where a change in temperature will take place. Chilled water systems should have sufficient metering to measure the system performance as well as individual components. Metering should measure the energy inputs and energy outputs of the chilled water system. This metering is necessary to determine system optimization and to analyze capacity-related issues. Flow-measuring devices should be installed in chilled water, condenser water, steam, and makeup water lines to the cooling tower. The flow meters must have sufficient straight runs of pipe upstream and downstream of the meters to ensure meter accuracy. Flow-sensing elements can be of the ultrasonic, magnetic, vortex shedding, full-pipe-size positive displacement, full-pipe-size turbine, insertion turbine, insertion differential pressure, orifice plate, or venturi style. Modern chilled water energy meters consist of a wide variety of flow-sensing elements, several temperature-sensing devices, and an electronic processor that receives input to calculate and totalize the energy. Programmable electronic devices can communicate with even more sophisticated centrally located computer systems. The accuracy of chilled water meters is a function of the turndown (range of the sensing), the precision of the flow-measuring element, and the accuracy of the temperature-sensing device. Care must be taken to clearly understand the implications of the specifications on the accuracy of the energy meter. The greatest potential energy calculation inaccuracy occurs with the temperature-sensing devices. For example, a temperature-sensing device with a range of 0° to 200°F, with an accuracy of 1 percent of the full-scale range, will have an output accuracy of ±2°F. In a chilled water system with a design differential of 10°F, the accuracy of the system would be ±20 percent. For any meter to function within its accuracy range, it must be routinely calibrated and accurate records maintained on the calibration procedure. Thermal insulation with a vapor barrier is required on chiller evaporators, refrigerant suction lines, compressors, expansion tanks, chilled water supply and return lines in the plant, and any other equipment connected to the chilled water system that is subject to sweating. The vapor barrier should be sealed at regular intervals along the pipe so that in case of a leak or damaged vapor seal, the travel of the moisture will be limited. Chillers, heat exchangers, and tanks should be insulated with material such as fiberglass, cellular glass, or closed-cell foam rubber sheet insulation. Acoustic insulation may be needed to reduce the noise level on certain items in the central plant, such as chiller condensers and compressor discharge piping. Removable heads on chillers and heat exchangers should be insulated with covers that can be easily removed to allow access for inspection, cleaning, and dismantling. Insulation material that is not subject to damage by moisture is preferred. All low-temperature insulated piping within the chiller plant, buildings, and vaults should have insulation at each hanger, support, and anchor. The insulation should also be protected with shields of galvanized metal extending not less than 4 inches on either side of the support bearing area, and it should cover at least half of the pipe circumference. Pre-insulated steel pipe is a popular material and minimizes field insulation labor. Soil temperatures at burial depths will determine the magnitude of energy loss to the soil with uninsulated direct-buried pipe as well as various insulation materials. An energy evaluation is needed at each central chilled water site to determine what, if any, insulation is needed. If it is determined that it is economical to install insulated pipe, then pre-insulated pipe is available in various pipe materials. The central chilled water system criteria are a set of requirements that provide guidelines for the design and operation of all equipment as well as the thermal systems. The central chiller plant represents only part of the overall chilled water system, and the system criteria should not be limited to this facility alone. Other equally important parts include the distribution system and building systems. A single philosophy must exist for the design and operation of the entire chilled water system if the individual parts are to function correctly and economically. Operating problems and difficulties in many central cooling systems can be traced to a single common cause: incompatibility among the chilling equipment, piping systems, and terminal loads. A complete hydraulic analysis is a necessity to determine the system performance. Deficiencies and strengths of the system can be identified with such an analysis. Without this comprehensive evaluation, many systems have been installed with serious deficiencies. Significant rework of previously installed components, with the attendant significant replacement and operating costs, has occurred in many institutions as a result of failure to perform this step. This is one of the most important steps to be completed before proceeding with any capital investment. Component compatibility can be analyzed after completing the hydraulic analysis. The hydraulic analysis addresses the volumetric component of the chilled water, but it does not include the energy component of the chilled water. Therefore, an energy analysis must be completed. Any system analysis should take into account the installed cost along with full consideration of the operating cost over the life of the system. The temperature differential between the chilled water supply and return should be maximized, which will minimize the flow volume of chilled water to meet the energy capacity of the chilled water. A reduction in chilled water flow volume reduces the pump energy required to move the water and also may reduces the pressure loss required to transport the chilled water throughout the system. Therefore, increasing the temperature differential between the chilled water supply and return has a dual effect on reducing the pumping energy by reducing the flow volume and possibly pressure loss within the system. The energy capacity of a given distribution main can be increased simply by increasing the temperature differential between the supply and return main. After the previously listed items have been completed, the pumping methods and piping configuration should be examined. Caution should be exercised not to attempt to correct component incompatibility by altering pumping methods or piping configuration, as this can plague the performance of the entire chilled water system for years to come. The piping and pumping configurations should result in the least complicated and most energy-efficient system. The number and sophistication of controls and pumps associated with the system should be kept to a minimum. If the system cannot be easily explained to and understood by a nontechnical person, then errors have probably been made in arriving at the optimal system configuration. There are three commonly used piping and pumping systems in most chilled water systems: primary, secondary, and tertiary systems. There are numerous permutations of equipment layout within these three types. A primary only system has only one set of chilled water pumps. These pumps circulate the chilled water through the chiller(s), and can also circulate water through the supply distribution piping, building supply piping, terminal units, building return piping, and return distribution piping to return the chilled water to the pump suction. A tertiary loop has three individual piping loops. It adds one more pumping loop to the secondary system described above. This would typically occur at building connections but is not recommended for chilled water systems. Chillers can be connected to individually dedicated cooling towers or into a common header. This physical layout should be fully analyzed to ensure equipment compatibility. Chiller and tower equalization must be met so that capacity or efficiency is not compromised throughout the range of varying loads. Pumping costs should be minimized to keep the overall efficiency of the chilled water system as high as possible. Therefore, flow rates to individual components and bypasses around equipment should be kept to a minimum. Typically, chilled water pumping horsepower should be approximately 0.05 BHP per ton of chilled water capacity. Delivered pressure should be only high enough to meet the circulation needs of the system. Excessive pressure causes control valves to throttle the flow, which creates an energy loss in the system. To prevent over-pumping, variable-frequency-drive pumps should be installed in most situations to minimize pumping energy for the system. Pumping energy is transferred into the chilled water, which ends up adding to the cooling load of the system. Ideally, the pressure required to circulate the chilled water from the chiller through the buildings and then back to the chiller should normally be less than 40 psid (pounds per square inch differential). If greater pressure drops occur, the system should be analyzed to locate inappropriately sized equipment and piping. Decisions that are made in selecting and arranging equipment will affect system operation for many years. Therefore, care should be taken to accurately analyze all aspects of the decision-making process. The design requires an investigation of all details and coordination of the many ideas and requirements into an optimum end product or facility. A good design will make provisions for future expansion and anticipate the flexibility needed to take advantage of new ideas, equipment, and technology. A design that considers only present needs and technologies probably will not make for a cost-effective facility in the future. During the development of the design for a central chiller plant, the primary concern is the process, equipment layout, access for maintenance, and future expansions. A plant building should not be designed until the layout of the equipment and all support systems is well established. The building is an enclosure to protect the chilled water equipment and should be a functional part of the overall cooling facility, not the dominant factor. The process should not be changed to accommodate the size of the building or restrictions imposed by the building. The same is true of the site or location for the plant; if major equipment layout changes are required to adapt a plant to a particular location, then perhaps the site is wrong. System reliability is a product of component quality and durability in conjunction with the preventive maintenance programs. Redundant equipment is sometimes employed for seasonal load variation and reliability, and where critical environments justify the additional capital and maintenance expenditure. Certain electricity demand rates can also justify adding particular system components to avert expensive electrical penalties if equipment downtime occurs. The system criteria are tools for selecting equipment and developing operating procedures. The criteria must be established when the design of the central chilling plant is started and then must create a compatible design among the plant, the distribution system, and the buildings served. The requirements established by the system criteria must be considered each time the plant is expanded or a new building or facility is added. The combined characteristics of all the building airside systems are one of the major factors in developing the system criteria. These same characteristics will be a determinant of plant economics. Airside systems must not be operated far from their design conditions if economical, high-quality air conditioning is to be provided. Designing and constructing a central chilling system are major undertakings. System reliability, performance, and serviceability are all critical elements in the design process. Initial decisions will have significant implications for plant size. It is obvious that an undersized plant will have detrimental end results. Oversizing a plant may not have the obvious disadvantage of undersizing, but it can cause the overall project to be burdened with excessive capital expenditures and result in poor part-load energy efficiency. Careful thought should be given to sizing decisions early in the design process. A unitary arrangement, in which a single pump is dedicated to a specific chiller (Figure 9). This arrangement may be found in both primary and variable primary flow pumping systems, as well as in condenser water pumping systems. A primary/secondary pumping system, in which the hydraulic head requirements for the chiller and in-plant piping are furnished by pumps dedicated to specific chillers, and the distribution system hydraulic head requirements are furnished by a separate decoupled pump circuit (Figure 10). 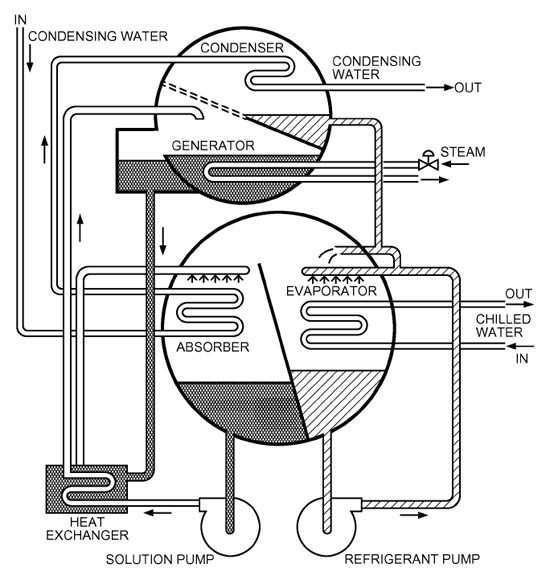 A headered arrangement for chilled water pumps, in which a number of pumps discharge into a common header serving a bank of chillers (Figure 11). This arrangement may be found in both primary and variable primary flow pumping systems. This type of arrangement may also be found in condenser water pumping systems. Variable primary flow pumping systems have become more popular as chiller manufacturers are allowing the chilled water flow to vary through the chiller evaporator. This allows the chillers to work at higher load factors as a result of the varying chilled water temperature differentials, which can vary depending on the season. A bypass is typically provided to ensure the chiller does not operate below the minimum allowable chilled water flow rate. The other advantage of variable primary flow systems is that fewer pumps are required, resulting in less space needed within the central plant. Building connection analyses are important for the entire chilled water system. Tertiary loops should be avoided at the building connections. This method artificially attempts to increase the building temperature differential by recirculating the chilled water return from the building and can have disastrous results. Building humidity control and system hydraulics can be hindered to the point of making the system inoperable. Low return temperature is primarily the result of improperly selected coils or coil control valves. Coils should be designed for the maximum chilled water temperature differential. The water performance of a cooling coil is based on the mean temperature differential between the supply and return water temperature at selection. If the chilled water supply temperature increases, the chilled water return temperature will decrease to maintain the same mean temperature. This requires great attention during the coil acquisition and installation process to make sure that the coil performance can maximize the chilled water temperature differential and still meet the building cooling requirements. 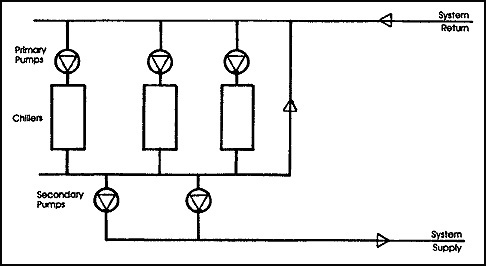 A straight primary interface, in which the necessary building circulating head is supplied by the central system pumps (Figure 12). 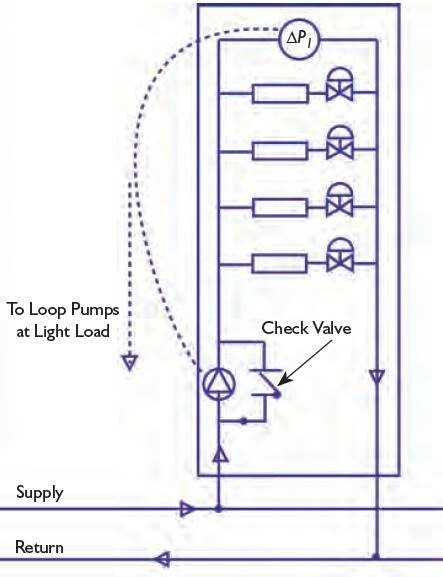 A variable-speed booster pump building interface, in which central plant pumps provide building circulation when adequate head is available and building chilled water pumps provide additional differential pressure when central system head is not adequate to meet load requirements (Figure 13). A differential pressure sensor is required at the hydraulically remote location in the building to control the booster pump. Buildings connected to a central system will not experience peak load at the same time. This relationship between the sum of the peak loads for individual buildings and the actual aggregate central system peak load is known as the diversity factor. For example, dormitories may have reduced loads during the day and peak loads in the evening; libraries and laboratories can have substantial loads during the day that may extend into the evening hours; classrooms and administrative areas usually have peak demands during the day only; and auditoriums and athletic facilities have peak demands associated with specific activities. It is difficult to predict diversity with new systems, whereas with adequate metering, information on existing buildings that are being considered for connection onto a central system can be determined with reasonable accuracy. Central plants can be designed for a capacity of something less than the sum of the individual buildings. The magnitude of this reduction is affected by the type and number of building connections. This phenomenon should not be overlooked, as this is an opportunity to save capital when installing new equipment. Typical university campus cooling diversity factors can range from 0.5 to 0.7. If a plant can be sized to operate near design conditions, overall plant efficiency will be optimized. Oversizing the chillers will lead to poor part-load energy performance. The ratio of the total cooling energy produced over a year compared with the total potential generated by the installed chilling equipment is defined as the load factor. Load factors typically range from 9 percent to more than 25 percent. This ratio is highly dependent on the climate and the type of loads that are connected to the system. Comparisons can be made between similar installations to arrive at some guidelines for evaluation of existing and planned systems. Even with a load factor of 25 percent, it is evident that chilled water systems have the capability of delivering significantly more chilled water than is actually generated. Because most load on the systems is comfort cooling, additional comfort load cannot be added without affecting the peak demand on the system. Adding process loads that are present year-round increases the load factor without substantially affecting the peak demand. These process loads take advantage of the invested capital. 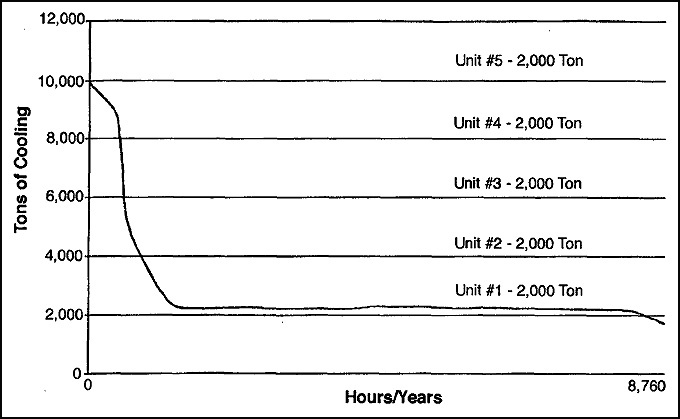 Load duration curves are used to graphically show the central plant installed capacity, the load demands, and the time duration per year for the system load operated at each level. This is illustrated in Figure 14. The load duration curve can be helpful in determining equipment sizing. The total cooling produced is equal to the area under the curve. The area under the horizontal line, representing the plant installed capacity, equals the total potential capacity for the plant over a year. The ratio between these two areas is equal to the plant load factor. Load duration curves can also show the amount of time the system operated at a specific capacity. The equivalent full-load hours can be determined by taking the area underneath the operating curve (total energy produced) and dividing it by the total installed plant capacity. Horizontal lines can be drawn to indicate the incremental available capacity as individual chillers are operated. Machine sequencing can be illustrated to show when specific chillers will be operated. It can be seen that, as additional chillers are needed to operate, hourly utilization of these chillers begins to diminish. Many chillers are most efficient at some percentage of rated capacity and variable speed chillers are most efficient at lower capacity. Multiple units within a facility allow chiller generation capacity to match overall system needs more closely by sequencing the chillers to match the load profile. The downside to having multiple chillers is that the cost to purchase and install many small machines is significantly higher than it is for fewer larger machines. The magnitude of the load duration curve can exceed the plant installed capacity curve on systems that do not have the capacity to meet the peak demand on the system. This can be a temporary state caused by recent additions or a condition that is not intended to be addressed based on an economic evaluation versus the duration of peak. Options may exist to shed noncritical loads a few hours per year. Other systems may allow the entire system to uniformly shed load by allowing the chiller discharge temperature to rise after rated capacity is achieved. Thermal storage is another element that can be included in the load duration curve. Thermal storage benefits can be illustrated to show how load requirements can be met when exceeding the installed capacity of the chiller plant. The total generated chilled water will be the same with thermal storage as when using chiller equipment. The peak of the generation curve is removed and added back into the area under the curve. The peak chilled water demand for specific building types can be calculated by applying industry standards for gross square footage per ton. The demand for a particular building can be calculated by multiplying the building square footage by this factor. For central plant cooling systems, standard ranges from 400 to 700 sq. ft. per ton. The lower tonnage range generally applies to buildings that have low air exchange rates and are well insulated. The upper range applies to buildings that have high air exchange rates (e.g., laboratories and hospitals) in extreme cooling climates. Individual buildings have larger performance factors if they are going to be served by localized equipment, because central cooling systems experience load diversity. Central chilling plants usually have multiple water chilling units, cooling towers, pumps, boilers, and associated equipment. From time to time, each item of equipment will be out of service for cleaning, maintenance, or repairs. Cleaning and maintenance usually require a scheduled outage for a relatively short period. Planned extended outages are normally scheduled during periods of minimum cooling loads. On the other hand, required repairs to major equipment may not be scheduled. The total capacity of a central plant is the sum of the capacities for all units installed. However, the firm capacity is the sum of all units installed minus the capacity of the largest unit. This assumes that all units are potentially operational and can produce their rated capacity; otherwise only the units that are actually operational at the time should be used to determine plant capacity. The firm capacity is the maximum capacity that the plant can be expected to produce on a continuous basis. As buildings and new loads are added to the system, reserve capacity is used and expansion of the plant will eventually be required. Reserve capacity is any plant tonnage above the maximum system demand, up to the firm capacity. Some extra capacity can be attributed to reserve and future capacity. When multiple machines are used to achieve the needed capacity, reserve capacity is already built into the system in the event that one machine is out of service. Although it is good to design a plant with some excess capacity, extremes of excess capacity will hinder the project economics and return on investment. A central chiller plant represents a large capital and operating cost. To determine optimal performance of a central chilled water system, the full- and part-load performance data for each chiller should be used to determine which chiller or combination of chillers will deliver cooling in the most efficient manner. Maintaining the equipment in good working order with proper controls and adjustments for optimum energy efficiency takes on great importance. In the following paragraphs, certain operations and maintenance considerations unique to central chiller plants are discussed. Each chiller has a manufacturer-recommended charge of refrigerant. These recommendations are based on maximum summertime cooling. The theoretical charge for other operating conditions will be different. Operating personnel from various parts of the country have reported significant energy savings by reducing the charge during periods of low load operation. Chiller condenser and evaporator heat exchanger cleanliness should be monitored throughout the cooling season by calculating the fouling factor to determine when equipment must be cleaned. Automatic online tube-cleaning systems for chiller condensers are proven energy conservation methods. They are designed to keep the inside (water-side) surface of the tubes free of any deposits that would interfere with the heat transfer process. Two types of online tube cleaners are available: a brush system and a sponge rubber ball system. In the first type, the flow of water through the condenser is reversed and causes a small brush to be pushed through each tube. A plastic cage at the end of each tube holds the brush until the next cleaning cycle. The second type injects sponge rubber balls into the water entering the condenser. They pass through the tubes and are then collected by a screen located in the leaving water. From the collection screen, the balls are routed to a circulating pump that reinjects them into the entering water. Equipment in the plant should be checked from time to time to be sure that it is operating efficiently. This is vitally important on the larger items of equipment, such as chillers, that use the largest portion of energy. A unit that has scaled-up heat exchangers, improper refrigerant charge, bad seals, or worn parts or is dirty will consume more energy than a similar unit that is well maintained. The energy input divided by the output (kilowatts per ton or pounds of steam per ton) is a convenient yardstick of performance. If the values begin to change, the cause should be determined and corrected. A heat balance should periodically be made on all major equipment. The importance of keeping records on equipment is well accepted. For many years the history of equipment performance was limited to logs that were filled out by the operators, along with utility receipts. Many plants currently have computer-based data-logging systems. These systems can log all data monitored at any time interval and can provide operating profiles on an hourly, daily, weekly, monthly, or yearly basis. They can monitor performance continuously and sound an alarm if allowable limits are exceeded. Compressor power consumption for a chiller increases as the compressor head (pumping energy) increases. Compressor head is reduced by increasing the chilled water temperature and/or lowering the condenser water temperature. A 1°F increase in chilled water or a 1°F decrease in condenser water will reduce the required compressor consumption by 1.5 to 2.0 percent. Temperature constraints and the economics of operating under various scenarios should be investigated to determine the optimal operating temperatures under a given service condition. Many central cooling systems operate year-round. During periods of cool weather, savings can be realized by using the cooling tower condenser water to cool, rather than operating chilling equipment. 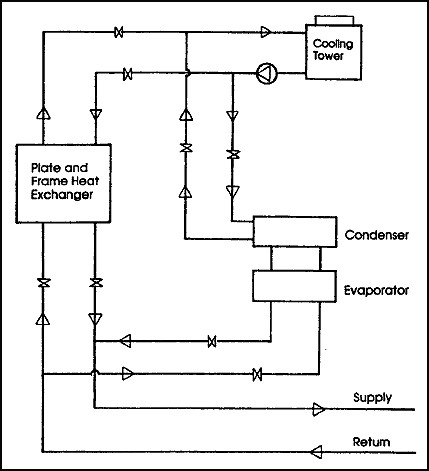 A heat exchange device is required to separate the condenser water from the chilled water. Operating in this mode is called free cooling. However, the chilled water is not free, because auxiliary equipment still must be operated. Free cooling can occur when the outside ambient air conditions are cool, which is typically at times other than the normal comfort cooling season. Discharge chilled water temperature to the chilled water system is usually dependent on the outside air conditions unless controls are installed to mix the discharge from operable chillers with the chilled water generated from free cooling. Chilled water supply temperatures therefore increase with increasing outside air temperatures and humidity. The limitation of chilled water temperature fluctuations is dependent on the type of loads that are connected to the system. Process cooling requirements usually can tolerate elevated temperatures. Comfort cooling at locations where there is high internal heat gain within the occupied space typically requires much cooler water than process cooling loads. If the comfort-cooling requirement outside of the normal cooling season is small in comparison to process cooling, then the installation of small localized cooling systems to meet these needs may be justified. Localized cooling systems can significantly extend the free cooling season. Capital expenditures for installation of such equipment may be justified if large chilling equipment can be turned off for extended periods. In northern climates it may be possible to shut off chilling equipment for as long as six months a year by utilizing free cooling. Also in northern climates, it may be possible to produce free cooling by using chilled water to pre-heat ventilation air. Cooling tower freeze protection, through the application of sump heaters and/or heat tracing, must be considered. Options should include circulating water only in the tower basin or cycling tower fans when the outside air temperatures are well below freezing. It is desirable to run the cooling tower supply water temperature as high as possible when the outside air temperatures are below freezing. Thermal storage can be an effective means of conserving energy under the right circumstances and conditions. It is necessary to evaluate the economics of this option. Some utility companies are participating in the funding of thermal storage projects and are offering reduced rates for night or off-peak consumption. Usually both of these are needed to make the project viable. Thermal storage systems tend to be large, especially if they are storing chilled water. An ice storage system requires less space for storage, but must have additional cooling capacity to produce the ice. System demand for chilled water may exceed the available or economical capacity of the chilling equipment. Regardless of whether the installed capacity has been exceeded or electric demand charges make it desirable to limit the load on the chilled water systems, the methods to shed load will probably be the same. Loads can be selectively reduced, or the inherent characteristics of chilled water systems can be changed to allow the load shedding to occur somewhat uniformly throughout the system. Selective load reduction can be as basic as shutting off equipment or as sophisticated as an energy management system that has control over all chilled water system components. Energy management systems can reschedule activities and change set points on individual air handlers to decrease load for a limited period of time to remove peaks on the system. Increasing the chilled water supply temperature to the terminal units results in a uniform load reduction across the entire system. This normally will not be readily apparent to building occupants unless significant load reductions are needed or existing comfort cooling equipment has marginal capacity before the load shedding occurs. The chilled water temperature can be increased intentionally by increasing the chiller set point. Another option is to load the chillers to achieve maximum capacity, at which time any further attempts to increase load will result in a decrease in the discharge chilled water temperature. The anticipated need should normally be recognized well in advance of the actual event. All users should have a full understanding of what to expect during a load-shedding situation. Feedback should be provided by the end-user so that undesirable outcomes do not result from this process. An effective water treatment program is necessary for the continued efficient operation of a central chilled water plant. Water treatment reduces fouling of the chiller heat exchangers and system corrosion. Water treatment programs for any central chiller plant should be formulated by water treatment professionals. Consulting professionals are available to oversee the treatment program and to monitor its efficiencies through laboratory analysis. Vendors can provide complete turnkey systems that address all aspects of water treatment, from the control-and-feed system to corrosion monitoring and chemical supplies. The condensing water system is an open circulating system and is subject to problems of scale, corrosion, slime, and algae. As water is evaporated in the cooling tower, the dissolved solids will be concentrated in the remaining water. If the concentration is allowed to build up, the solubility of various salts will be exceeded, and scale will form on the hotter surfaces, such as condenser tubes. This can be controlled by blowdown or bleed-off in some cases, but it may be necessary to feed sulfuric acid for pH control, in addition to the blowdown, if the water is extremely hard and high in alkalinity. Open recirculating cooling water systems provide optimum conditions for microbial growth, and these microorganisms can adversely affect the efficiencies of the operation by sheer numbers, metabolic waste products generated, or deposits created. Microbiological treatment programs use oxidizing and nonoxidizing biocides, such as chlorine, hypochlorites, organic chlorine donors, or bromine compounds. Chlorine is effective but must be used carefully, because excessive chlorine will increase corrosion and adversely affect tower wood. Some plants have tried to reduce their expenses by cutting back or eliminating the chemical for water treatment and have caused irreversible damage to their systems. Occasionally a new nonchemical device appears on the market with claims for scale and corrosion control in cooling and boiler systems. These nonchemical devices may be based on mechanical, electrical, magnetic, electrostatic, or ultrasonic principles. If a nonchemical water conditioning device is being considered, it should be thoroughly investigated. Several successful applications on similar facilities should be inspected and evaluated. The chilled water system is contaminated to some degree each time a new building is added to the system or the distribution piping is modified. The degree of contamination depends on the condition of the new pipe installed and the thoroughness of the flushing and cleaning prior to connecting the system. Chemical treatment of the chilled water system usually includes the addition of a corrosion inhibitor. The system should be equipped with a feeder for introducing the chemicals. The corrosion inhibitor protects the piping from rusting and pitting and prevents the general deterioration of the piping system. This conserves energy by preserving the integrity of the heat exchange surfaces and prevents an increase in pumping head resulting from system deterioration. It is important to know what quantity of chilled water makeup is required for the system. This information can be used to quantify system leaks or dumping that may be occurring. Losses should be minimized to reduce the required cost of chemical and water as well as the potential environmental problems associated with discharging this chemically treated water down the sanitary sewer or storm sewer or into the groundwater. Communication and cooperation among the building, distribution, and generation personnel are vital components to operating a chilled water system. Information must flow freely among the three commonly defined territories of the chilled water system. Discussions should cover operating problems, operating parameters, calculation of rates, anticipated growth, outages, and modifications. A training program must be put in place to maintain and improve the skills of the existing operating and maintenance staff and to train entry-level employees. The training program should include equipment start-up and shutdown procedures, operating parameters, energy optimization, and routine maintenance. If major equipment overhaul or additions are implemented, staff training by factory personnel should be considered. The operation staffing of a central chilled water plant will be driven by the size and complexity of the system and should be integrated with the operation of other central utility services. The staffing of the maintenance organization for a central chilled water system can take a variety of forms. The maintenance function may be restricted to the central chilled water plant or may encompass the delivery and end-use systems as well. Because the total performance of the system depends not only on the efficiency of production but also on the efficiency of utilization, an organizational and staffing approach that consolidates both functions may be beneficial. The scope of maintenance services provided by in-house staff is a decision that will require careful review. In large systems it may be more economical to perform annual maintenance and overhauls with in-house personnel, while smaller installations may be served through contract services. In almost all cases, specialty services such as oil sample analysis and eddy current testing can be most economically provided through contract services. Meter chilled water plant energy efficiency to understand how well the existing plant is actually performing. Evaluate if new VSD chillers will improve annual plant performance. Chillers today are superior to chillers 15 years ago, with substantial energy-efficiency improvements. Replace cooling coils to achieve a high water temperature differential. This will reduce pumping costs and allow the system flow to become more compatible with the design operating conditions of the chillers. Install carefully selected two-way control valves on terminal units to replace oversized two-way valves, three-way valves, or wild (uncontrolled) circuits. Pressure-independent control valves are another option to improve water-side flow control. Remove unnecessary pumps from the system to reduce energy consumption. Replace undersized piping and loop the distribution system to reduce pump head requirements. Install computer control systems that will allow automatic dispatch of chillers to ensure that the most efficient equipment is in service and appropriately loaded to efficiently serve the system load. These systems can also automatically optimize condensing water temperature and minimize chiller energy requirements. Add chilled water storage to a system to reduce peak electricity demand as well as serve additional loads without the need for added chiller capacity. Develop a computerized hydraulic model of the distribution system to determine minimum plant pumping requirements to meet any given load and also to identify needed distribution system improvements to serve planned growth. Install plate and frame heat exchangers to take the place of mechanical refrigeration during periods when low condensing water temperatures are possible. A typical arrangement of this method is shown in Figure 15. If chilled water systems serve loads that are relatively constant throughout the year, such as for computer systems or clean rooms, the installation of small stand-alone chiller units may allow the central system to be shut down entirely during winter months. The free cooling season may also be extended on those systems that run 12 months a year. American Society of Heating, Refrigerating, and Air-Conditioning Engineers. 2009. ASHRAE Handbook - Fundamentals. Atlanta: ASHRAE. American Society of Heating, Refrigerating, and Air-Conditioning Engineers. 2008. ASHRAE Handbook - HVAC Systems and Equipment. Atlanta: ASHRAE. American Society of Heating, Refrigerating, and Air-Conditioning Engineers. 2006. ASHRAE Handbook - Refrigeration. Atlanta: ASHRAE. Calm, J.M. and D.A. Didion. 1997. Trade-Offs in Refrigerant Selections: Past, Present, and Future. Atlanta: American Society of Heating, Refrigerating and Air-Conditioning Engineers, Inc. See also: http://www.trane.com/commercial/issues/environmental/trade-offs05.asp. Pacific Gas and Electric Company. May 2000. Cool Tools Chilled Water Plant Design and Specification Guide.